Bordeaux liquid is one of the most effective fungicides (chemicals) used to protect garden plants from various fungal diseases. At the right dosage this drug is not toxic to plants and beneficial insects. As you know, almost all garden plants and vegetable crops subject to a number of fungal diseases that can not only destroy the entire crop, but also to bring plants considerable harm. That is why most owners of HOMESTEAD lands (especially in spring) is literally swept off the shelves of farm shops, the popular remedy is Bordeaux liquid. Bordeaux liquid is extremely effective, also very cheap drug, prepared from the working mixture in a few minutes. 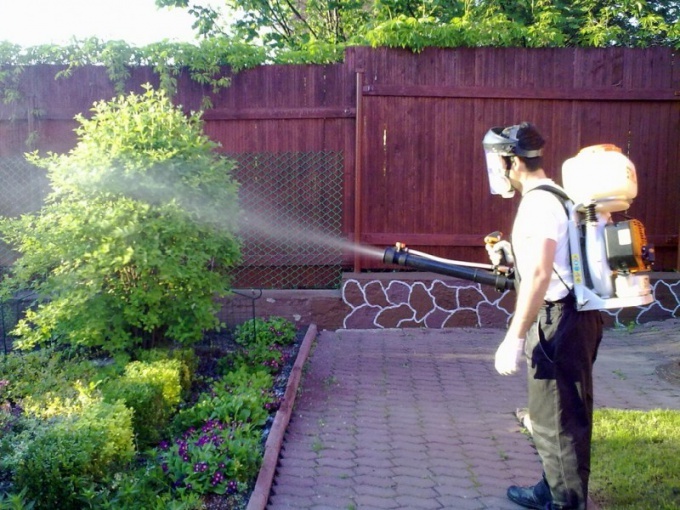 Spring treatment plant, the tool is most useful, therefore, to produce spraying should be in two stages – in the early spring (dormant period of the plants) in the vegetation period. Preventive processing of horticultural crops can be produced throughout the spring and summer season. However, it should be remembered that Bordeaux liquid is still a chemical and its excessive use can be dangerous for the plants and for human health. In order to reduce all risks to a minimum, you must adhere to the following principles: the latest treatment trees (apples, pears, plums and other) necessary to produce 28-30 days prior to harvest, the processing of the same vegetable crops (tomatoes, peppers, cucumbers) for 12-14 days before harvest. For preparation of Bordeaux mixture will need two components: 1 kg of copper sulphate and 1 kg of lime. First, we need to dissolve the entire quantity of copper sulphate in 50 liters of cold water. Important: to be used for mortar only wooden or plastic containers. Once the solution is ready, you can play lime. First you need to dissolve the lime in 10 litres of cold water, and then diluting the mixture 50 liters of water. Mix the two components gently and thoroughly. To do this, pour a solution of sulphate of lime in solution in a thin stream, stirring the mixture at the same time. As a consequence of the chemical reaction that occurs when mixing the sulphate and of lime, the temperature of the mixture will rise. To start spraying only after its full cooling. I must say that the treatment of trees and plants Bordeaux liquid effective against many fungal diseases: late blight (tomatoes, potatoes), downy mildew (onion, cucumber), Anthracnose (cucumber), scab (Apple), bacterial cancer (peach, cherry, Apple), perforated spotting (apricot, cherry, cherry) and other infections. For work treatment plants Bordeaux liquid, use a special sprayer for 3-5 liters, which can be purchased at any agricultural store. In order to comply with the safety necessary to work only in a respirator or in a protective bandage.